Fuji shattered compact system camera’s market with release of the Fuji X-Pro 1 an innovative rangefinder style compact system camera with very high dynamic range and good low light capabilities. Besides the Fuji XF mount lens the Fuji X-Pro 1 compact system camera is also able to use other lens via adapters. Thinking on a more professional audience Fuji launched an M-Mount adapter enabling photographers to use Leica M lens with their X-Pro 1 camera. The new M-Mount adapter has a 27.8mm distance between lens and sensor to meet correct focal distance and is made of aluminium and stainless steel together with tree levels of distortion correction. Once plugged in the adaptor displays a special menu in the camera where different lens profiles and lens correction software can be selected (available since firmware update 1.10). The M-Mount adapter has electronic connections enabling the Fuji X-Pro1 camera to record EXIF values based in lens profiles recorded in camera database. The hybrid viewfinder also works well with the adapter being possible to have display of image in viewfinder, LCD screen and Optical viewfinder. Besides having presets for the 21mm, 28mm and 35mm Leica M lens it is also possible to add custom entries to menu. Focus with the Leica M Lens is manual. If you always wanted to take photos with a Leica but never had the opportunity or you find it too expensive you can now have access to a transvestite Leica with the M-Mount Adapter enabling you to have access to the much looked for Summilux lens. Although lens work well you have to be aware the Fuji X-Pro 1 does not provide the same angle of view due to cropping factor resulting when compared to a full frame Leica and lacks the mystique of using a Leica body when taking photos. 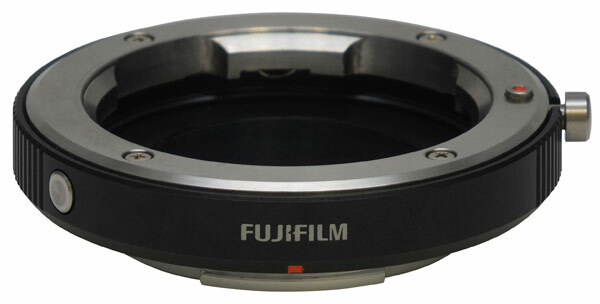 The price of the M-Mount adapter for the Fuji X-Pro 1 will be of $199.99 and will become available in June.